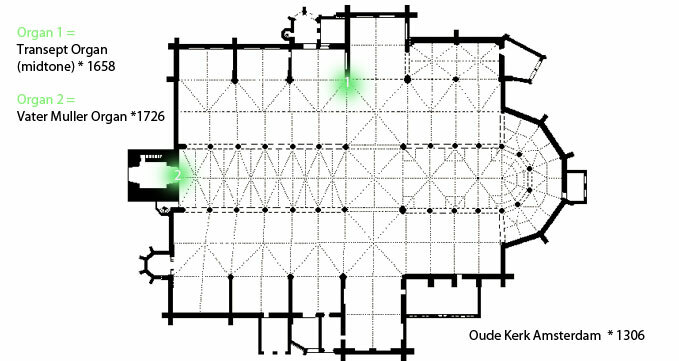 The two church Organs in Old Church of Amsterdam are used to create a stereo effect by pushing the maximum amount of volume out the organs shortly after each other in an attempt to synthesize the stereo sound of a Fighter Jet passing through the church. 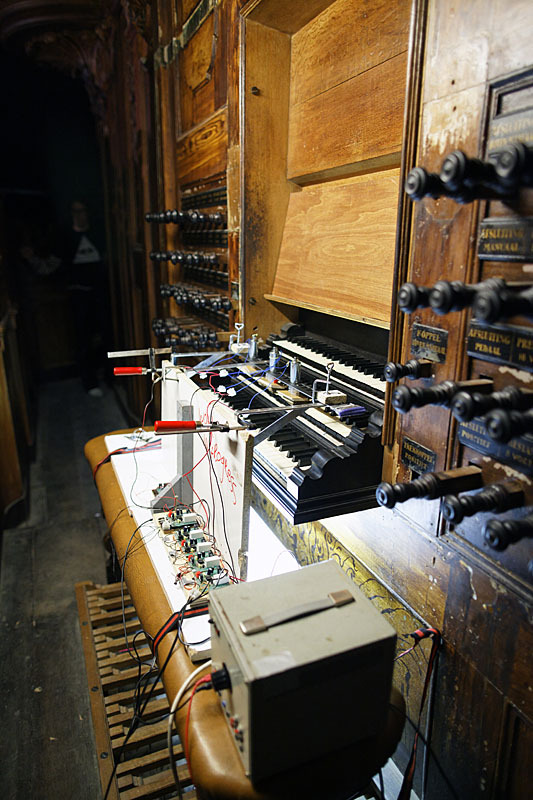 The work of composer Ligeti is the starting point for this work, Ligeti described composing for the Organ as working with a mechanical arm, due to the expressive limitations of the organ. With his piece "Volumnia" Ligeti explored the sound limits of the church Organ treating to it’s mechanical maximum with two organ players. When this piece was played for the first time the electrical air pump in the Organ caught fire due to the enormous amount of cluster chords (big volumes) and the Church Organ burnt down. A countdown clock triggers the two big church organs of the "Oude Kerk Amsterdam" to blow out as much sound the organ can produce at ounce. This happens about every 5 to 8 minutes, the time is generated randomly and displayed in seconds on a screen. When the countdown reaches zero: The center mid tone organ blows for 1,5 seconds, directly followed by the Big Organ with a blast of 2 seconds ending in the sub low register. In this way a stereo effect is produced through the Church, which did not sound exactly like an fighter jet, but had a sensation of movement. The acoustic re-verb in the church rings out for about 11 seconds. Space: Oude Kerk (Old Church) Amsterdam. Context: During museum night group show. Material: Transept Organ *1658 Vater-Muller Organ *1728, computer, software, mechanical devices. Supported by Basis for Live Art.